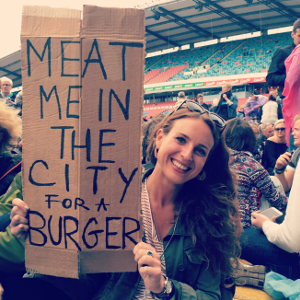 When I first started Burgers and Bruce my aim was to review a burger in every city that Bruce Springsteen plays. Whilst I don’t doubt my ability to eat that many burgers, it’s not been as easy as you might think. The problem is, I don’t want to eat any old, sorry for itself burger. If I’m eating something, I want it to taste really good, so that I can recommend it on to other Springsteen fans. I had my first burger eating problem in Florence, Italy this year when visiting the city a few days before seeing Springsteen in Rome. I searched high and low for recommendations for a decent burger in the city, but to no avail. I then contacted fellow food blogger Giulia Scarpaleggia over at the delicious Tuscan food blog Juls’ Kitchen for her recommendations. 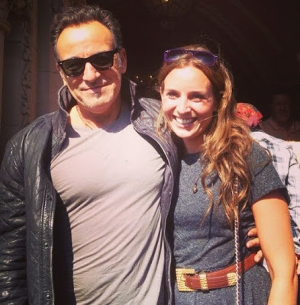 Giulia is also a huge Springsteen fan, therefore I trust her implicitly. She told me that decent burgers in Florence are hard to find, and suggested instead that I try the city’s famous street food dish ‘panino al lampredotto’. I’m all for street food, whether it’s London or abroad, so I clicked through to her recommendation with excitement. I thought about that word. Not one I use often I admit. Hang on, is tripe what I think it is? Yes it is. I was a bit hesitant, but after reading the blog I decided to get a grip, man up and try it. I had a month until my trip, so some time to build myself up to it anyway. So I went to Florence and I filled up on ice cream and pizza and steak and all the things I’d been looking forward to eating. I then thought it was about time I faced my tripe eating fears and I headed to San Lorenzo food market, a covered food market in the city with counters selling various different dishes. Now I found a few counters serving this “workmen’s sandwich” but I wanted to go to the one Giulia said was best, Nerbone. I ordered my ‘panino al lampredotto’ in my best Italian (that’s mumbling the words, pointing to the dish and signalling the number one) and I watched the old fella slice a crusty white roll and pull a chord of tripe out of some sort of vessel (it really was chord). He dipped it in what I can only describe as a steaming tripe broth, I think someone more qualified on the joys of tripe could expand, before he chopped it up into loads of little bits. Probably so it was easier for me to swallow. I asked for lots of salsa verde, salt and pepper and headed over to the plastic table and chair seating. The first few bites were harmless, mainly crusty bread which was now doused in the various oily sauces. Tasty. Third bite. I glance over the top of my crusty roll at the old man who has made my tripe panino for me. He looks all excited. I attempt a smile, a thumbs up and a “mmmmmmm”. There is something a bit off about the smell (I suppose it’s just unfamiliar) and the texture…it looked like it was going to be a case of chewing on a rubber band that had festered somewhere dark and hot for a few days. BUT, combined with the bread and the sauce, the flavour wasn’t too overwhelming and the texture bearable. I’m shocked to admit, I was quite enjoying it. OK, it would have been a struggle to eat a plate of the filling on it’s own, but stuffed between the bread with the fresh salsa verde, it evens the taste out nicely and it’s surprisingly good. So that’s a very brief take on Florence’s finest street food, it’s best replacement for a burger. Did I forget to mention? ‘Lambredotto’ is the fourth and final stomach of the cow. Totally understand if that’s not your thing, but it’s cheap and well worth trying for a bit of local flavour I think. If that doesn’t appeal, then some pizza or steak surely will? Pizza at Gusta Pizza – eat in, or take out and sit in the nearby Piazza Santo Spirito for some quality people (and pigeon) watching. Bistecca Fiorentina at Trattoria Mario – cosy up and share tables at this little trattoria, popular with locals and tourists alike. Aperol Spritz, anywhere (the only thing to drink in Italy, I think). Italy. The best country for tripe. And seeing Bruce Springsteen live. Have you had a veggie burger?